Brethren, I have been asked to talk to you this evening about the history of this building and its Masonic use. However, I thought that, with your indulgence, I would expand the story a little and talk about Masonry in Stow on the Wold and the buildings that have been used for this purpose. As you all know, this building that we are in and hold our meetings in is owned and used by the Prince of Wales Lodge. However, it was not this house that the Prince of Wales Lodge started its existence. 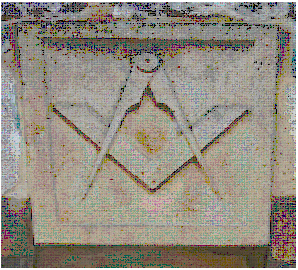 Masonry in Stow, as far as I can tell, began with the formation of the Prince of Wales Lodge, Number 951, in 1863. That Lodge met, initially, at the Unicorn Hotel at the top of Sheep Street. The Unicorn Hotel is an 18th century building that was originally a coaching house, inn and meeting place. In 1869 a new building was created with a custom built Masonic Temple. Perhaps unsurprisingly this new home for Masonry in Stow had a connection to beer. Half way down Sheep Street stood the Victoria Brewery. The brewery was built around the time of Queen Victoria’s accession in 1837. Thomas Clifford was a local stone mason and is known to have been involved in its construction. It is now “Brewery Yard” with its shops. The main brewery office still stands on the main road and is now a book shop. It is quite an interesting building and unique in Stow. 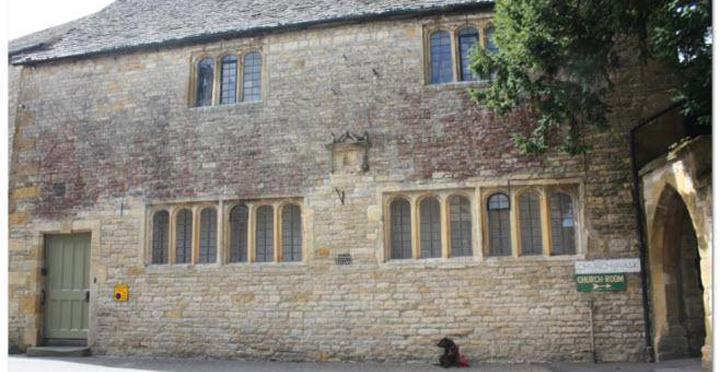 It is, in the main part, built of local Cotswold stone, but the front is faced with flint stones. No one knows where the flints come from or why it was decided to dress the building in this stone. The brewery office was built by Richard and William Gillett in 1869. The brewery office was built with offices downstairs and a Masonic Temple on the upper floor. Prince of Wales continued meeting at this Lodge for a number of years. And in 1876 William Gillett was Worshipful Master. POW continued to use the building until 1894. The Victoria Brewery closed in December 1913, due to competition any rising costs. So, now we come to this building. It is recorded that in 1381 a certain ‘Jon Scorlmarster’ was among the tax payers of Stow. It was common of the time for men to be given a surname that matched their profession. On this site a building stood that may well have been used as a school and immediately behind it a hospital. They would have almost certainly been constructed of wood. In 1475 William Chester (Richard Chester father of William erected the cross in the square) founded a school here and had the building constructed. This was during the reign of Edward IV and about the time that the church tower was erected. Chester was a wealthy London merchant with lands in Southwark. He desired ground ‘as right the Church of Stow as can be had’ to build Almshouses. He also gave to the Trinity Charity and a priest was to have a stipend of £6 per annum to teach the children of Stow. Unfortunately the building was not maintained and by 1594 was in ruins. “A scholastic foundation for poor children rebuilt by Richard Shepham citizen and merchant of London A.D 1594”. ‘for the instruction of boys and children in the Latin tongue and other polite literature and science’. Shepham, in his will of 1604 left a sum of £36 per annum for the perpetual sustentation, government and maintenance of the school and the Almshouses behind. In 1613 one of the Masters of the school was a clergyman named Farmer. He built part of the school at his own expense and is thought to have installed the present main door. Farmer was also curate of Upper Swell Church and, while reading the Second Lesson suddenly collapsed and died. There is a stone in the church recording the tragic incident. Another Master of the school was Thomas Horde who was the son of the Squire of Nether Swell. In his will he requested that he be buried in the chancel of St Edwards Church. In 1847 Reverend Hippisley, Rector of Stow, took over as Headmaster and appointed an assistant head, whose salary was partly paid by a grant. The Grammar School ceased to operate in 1848 when the assistant head left to start a private school. The National School in Well Lane had opened in Stow in 1844. The Reverend Hippisley continued to draw the assistant’s stipend for some time after the closure; he later claimed to have spent the money on the National School. In 1889 the Charity Commission ordered the building to be sold, probably for less than its true value, and it was used for just a few years as a private residence. In 1893 this building was purchased by Prince of Wales Lodge and they have continued to meet here ever since and were joined by Sudeley Castle Lodge in 1984. The building itself holds quite a humble position in Stow. Indeed, many local residents do not know that it is a Masonic Hall. Behind the Hall used to stand Alms houses and, during excavations, a small vault was discovered containing ashes and a beautiful 5th century ring. Many ancient burials were discovered with skeletons interred under stone pyramid under the pavement that runs along side the building. Roman coins have been found all around. As you have heard, throughout most of its history this building has been at the heart of charity and education in Stow. It continues to do so to this day, and long may it continue.